One of the most important aspects of creating music in Music Creator is digital audio recording. This is the process of taking the sound from a microphone or an instrument and recording it to an audio track. 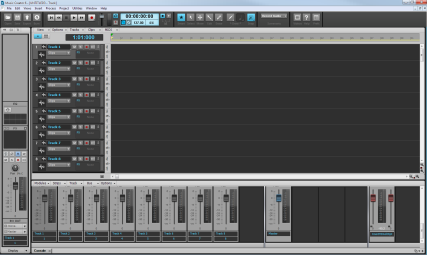 Once this step is completed, you can edit and mix the song to prepare it to share with the world. This tutorial will walk you through the steps involved and provide you with some insight on how to get the best possible audio recordings. Select the Normal template and click OK.
A new project is created. Let's change the screenset to Record Audio by selecting it from the Screenset drop-down menu in the Control Bar. At the bottom of the inspector, you will see the track's input and output drop-down menus. You can also change the input or output of a track in the Console View, which is shown in the MultiDock. The input and output selection are located in the same place in the Inspector and in the Console View. It does not matter if you change the input or the output of a given track in the Inspector or the Console View. The available inputs for the track are displayed. Select the physical jack that your instrument is plugged into. If you know, for instance, that your guitar is plugged into input 1, click the Input control and select the first option. Some audio interfaces refer to their stereo inputs as pairs, like 1/2, 3/4 or 5/6. Most often left channels are represented by odd numbers and right channels are represented by even numbers. Note: Most microphones and guitars are mono, so you'll want to select either the left or right channel accordingly. The available outputs for the track are displayed. Select the output that you want the audio track to play through during playback. You will usually choose 1 and 2, because these are most commonly the outputs that speakers or audio monitors are connected to. In the Normal Template, the tracks are routed to a bus named Master. To learn more about buses, see Stereo buses. Next, you will need to arm the track for recording. By arming the track for record, you are telling Music Creator which track you want to record to. There are a few places in Music Creator where you can arm a track for recording. For this tutorial, click on the Record Enable button for Track 1 in the Track View. At this point, we need to check the input levels to make sure they are sufficient and not distorting. Perform as you would if you were recording and watch the meter on the track respond to the sounds you produce. If the meter never even comes close to the maximum, increase the input level. If the meter even occasionally reaches the maximum, decrease the input level. Input levels are usually adjusted via a knob next to the input jack on the sound card. However, features like this may vary slightly between devices. If you have never recorded an instrument or microphone with your sound card, you may want to read about doing so in the device's manual. 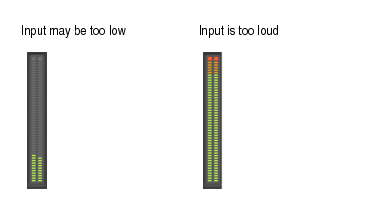 The following figure shows examples of input being too low or input being too loud or “hot”. You may need to play to a click in order to play in time with the song. Music Creator includes a metronome that can be heard during playback and recording. Click on the Prefs button in the Control Bar to open the Preferences dialog box, and under Project, select Metronome. Under Record Count-in, set the metronome for a 2 measure count-in. Note: You can set the count-in for beats or measures. Music Creator is set to count-in measures by default. Once you have completed these settings, you can turn the record and playback metronome on and off directly from the Control Bar. If you want to change the settings for the metronome, go back to the Preferences dialog box and under Project select Metronome. For details about the metronome options, see Setting the Metronome and Tempo settings. Make sure the track has been record enabled by clicking the track's Record Enable button. The Record Enable button on the track should be lit in red like this: . Again, if you don't arm a track, Music Creator will not know where to record the audio and the transport Record button will be disabled. On the Transport in the Control Bar, click Record, or press R on your computer keyboard. A new audio clip appears. Press Play to play back the project. If you would like to redo the take, go to Edit > Undo to undo the previous recording, then repeat steps 2, 3 and 4 above until you get a perfect take. Now that your first track has been recorded, you can “over-dub” another part. To do so, turn off the Record Enable button on the track you just recorded and repeat the steps in this section. After repeating the steps, you will have recorded to track 2. Both recorded tracks will play during playback. You can continue to repeat this process until you have recorded all the tracks you want for the song.